3. PGTs - 1. Two years’ Integrated Post Graduate M.Sc Course of Regional College of Education of NCERT in the concerned subject; Or Master Degree from a recognized University with atleast 50% marks in aggregate in the following subjects: a) PGT (English)- English b)PGT (Hindi) – Hindi or Sanskrit with Hindi as one of the subjects at Graduate level. c) PGT (Maths) Mathematics/ Applied Mathematics d) PGT (Physics)–Physics / Electronics/Applied Physics/ Nuclear Physics. e) PGT (Chemistry) Chemistry/ Bio. Chem. f)PGT (Biology) - Botany/ Zoology/ Life Sciences/Bio Sciences/ Genetics/ Micro Biology/Bio Technology/Molecular Bio/Plant Physiology provided they have studied Botany and Zoology at Graduation level. 2. B.Ed. or equivalent degree from recognized university 3. Proficiency in teaching in Hindi and English medium. Desirable : Knowledge of computer applications. 4. PGT (Computer Science) - At-least 50 % marks in aggregate in any of the following; 1. B.E or B. Tech. (Computer Science/IT) from a recognized University or equivalent Degree or Diploma from an institution/ university recognized by the Govt. of India. OR B.E or B. Tech. (any stream) and Post Graduate Diploma in Computers from recognized University. OR M.Sc (Computer Science)/ MCA or Equivalent from a recognized University. OR B.Sc (Computer Science) / BCA or Equivalent and Post Graduate degree in subject from a recognized University. OR Post Graduate Diploma in Computer and Post Graduate degree in any subject from recognized University. OR ‘B’ Level from DOEACC and Post Graduate degree in any subject. OR ‘C’ Level from ‘DOEACC’ Ministry of Information and Communication Technology and Graduation. 2. Proficiency in teaching in Hindi and English. 8. Yoga - Graduation in any subject or equivalent from recognized university and one year training in Yoga from recognized institutions. Age Limit: Candidates Age should Minimum and maximum age limit shall be 18 years and 65 years respectively as on 01.04.2016. How to Apply: Eligible candidates can appear for the Walk-in- interview with filled in applications (download from website) along with original certificates and a set of self-attested copies of the original. 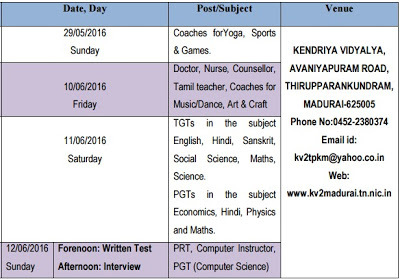 Qualification/remuneration for all the posts are mentioned in KV websitekv2madurai.tn.nic.in.